If you have a slow cooker and wonder which recipe will be successful, crock pot corned beef and cabbage with beer should be on your list. The recipe is so easy and practical that you can leave the slow cooker all day long and check out for the result at the very end of the day and smile for it. This crock pot recipe will give you a new experience of cooking using slow cooker with satisfying dish. Either you have ordinary dinner or special night, having corned beef, cabbage, and beer will be a good treat. Prepare a slow cooker. Place the baby potatoes, onion, and carrots in the bottom of crock pot. Pour water until the ingredients are soaked. Place the corned beef brisket on the top. Add the beer and pour over the beef brisket. Add spices from the package as desired. Cover the slow cooker and set to High. Cook the ingredients for 8 hours. After 8 hours of cooking, add cabbage and stir until well-mixed. Close the lid and cook for another 1 hour. Crock pot corned beef and cabbage with beer is set and ready to serve. Transfer to serving plate, garnish as desired. This recipe, apart from the slow cooking process, is highly easy to cook. It requires 15 minutes of preparation time and about 9 hours of cooking. It will be suitable to start cooking in the morning and serve the dish for dinner time. Crock pot corned beef and cabbage with beer recipe is not only practical but also nutritious. For each serving, it contains 427 calories, 49.5 grams of carbohydrates, 19.6 grams of fat, 23.6 grams of protein, 1281 mg sodium, and 99 mg cholesterol. This makes corned beef and cabbage a satisfying dish that will meet your daily nutrition intake. There is no more hard time when it comes to deciding the right recipe for tonight’s dinner. With this recipe, you will be able to serve the best for your family. Besides, cooking with slow cooker is the best way to save time. You can cook while doing housework. 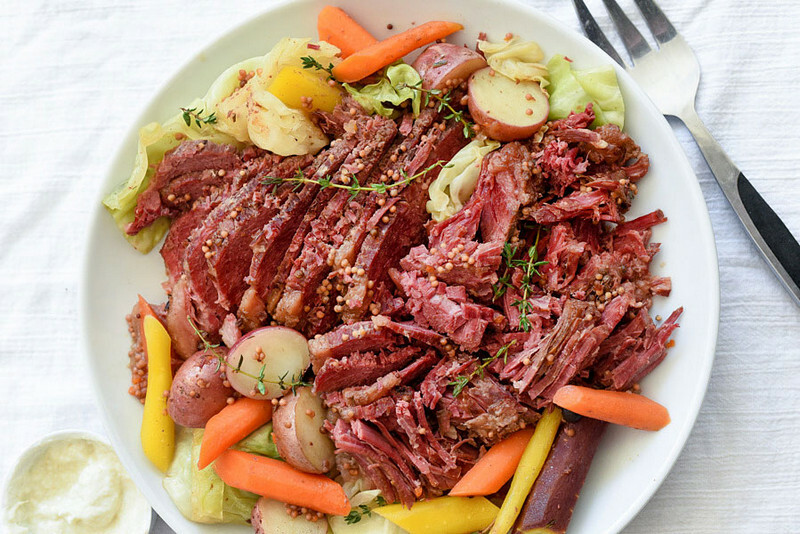 Try on crock pot corned beef and cabbage with beer and get the satisfying result! Related Post "Crock Pot Corned Beef and Cabbage with Beer, the Tasty Recipe for Slow Cooker Lovers"